A Singapore-based company yesterday launched a mobile application that enables Muslim foodies and travelers to share halal restaurant discoveries around the world. The free "HalalTrip" app, available for Apple iOS and Android devices, enables users to take and upload photos of halal dishes, write comments and share them through social media. Clicking on a photo gives details about the dish as well as the location of the restaurant. The app, which has English and Arabic interfaces, also uses a traveler's location to display photos of halal dishes served in nearby restaurants. The term halal is used for food, products and services that comply with Islamic requirements. "Halal food is one of the biggest drivers of tourism for the Muslim market," said Fazal Bahardeen, chief executive of HalalTrip, part of a Muslim-oriented business group called CrescentRating. "When travelling, one of the main concerns of Muslims is halal food. What we did is to bring in a social media element into discovering halal food and making it more fun and more intuitive," he told AFP. Bahardeen predicted the Muslim travel market would be worth $192 billion a year globally by 2020, up from $140 billion in 2013. In Turkey there are an estimated 5,000 firms with a halal certificate. 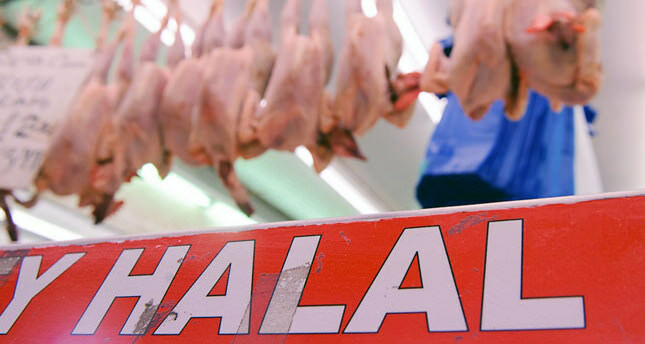 Turkey is one of the world's most important markets for halal food. Although the majority of the population is Muslim, Turkey is lagging behind compared to other countries with regard to halal certification. The consequence is that Turkish companies are only minor players in the global halal market. For example, Brazil exports $6.5 billion worth of halal meat to countries with Muslim populations. With their current production conditions, food companies in Turkey are well positioned to take a sizeable bite out of this market once the halal certification issue has been addressed. In Turkey, there are two institutions that have authority to give halal certification: the Association for the Inspection and Certification of Food and Supplies (GIMDES) and the Turkish Standards Institute (TSE). GIMDES is a nongovernmental organization founded in 2005, and in 2008, it became a member of the World Halal Council, which brings halal certification institutions to 58 countries. The institutions that accredit GIMDES are the Indonesia MUI, the Malaysia-JAKIM, the Sıngapore-MUIS and the World Halal Council. The halal food and beverage market grew to a $1.1 trillion industry in 2013, according to the latest research note by the Dubai Chamber of Commerce and Industry, which is based on a recent study by Thomson Reuters in collaboration with Dinar Standard. Globally, the halal food industry is growing in a number of markets - mainly in countries in the Middle East and North Africa (Mena) region and South and South East Asia. Indonesia is the biggest halal food market with a market value of $197 billion in 2012, according to the report. Turkey, with $100 billion, is the second largest market.